Donald "Don" McLean III (born October 2, 1945) is an American singer-songwriter best known for "American Pie", an RIAA "Song of the Century" (position 5 of 25) which is about the death of Buddy Holly and others. The 1971 album of the same name also includes "Vincent", about the painter Van Gogh. McLean's grandfather and father were also named Donald McLean. The Buccis, the family of McLean's mother, Elizabeth, came from Abruzzo in central Italy. They left Italy and settled in Port Chester, New York, at the end of the 19th century. He has another extended family in Los Angeles and Boston. Though some of his early musical influences included Frank Sinatra and Buddy Holly, as a teenager, McLean became interested in folk music, particularly the Weavers' 1955 recording At Carnegie Hall. Childhood asthma meant that McLean missed long periods of school, particularly music lessons, and although he slipped back in his studies, his love of music was allowed to flourish. By age 16 he had bought his first guitar and began making contacts in the music business, becoming friends with folk singers Erik Darling and Fred Hellerman, both members of the Weavers. Hellerman said, "He called me one day and said, 'I'd like to come and visit you', and that's what he did! We became good friends - he has the most remarkable music memory of anyone I've ever known." When McLean was 15, his father died. Fulfilling his father's request, McLean graduated from Iona Preparatory School in 1963, and briefly attended Villanova University, dropping out after four months. After leaving Villanova, McLean became associated with famed folk music agent Harold Leventhal for several months before teaming up with personal manager Herb Gart for 18 years. For the next six years he performed at venues and events including The Bitter End and Gaslight Cafe in New York, the Newport Folk Festival, the Cellar Door in Washington, D.C., and the Troubadour in Los Angeles. He attended night school at Iona College and received a bachelor's degree in business administration in 1968. He turned down a scholarship to Columbia University Graduate School in favor of pursuing a career as a singer/songwriter, performing at such venues as Caffè Lena in Saratoga Springs, New York and The Main Point in Bryn Mawr, Pennsylvania. Later that year, with the help of a grant from the New York State Council on the Arts, McLean began reaching a wider audience, with visits to towns up and down the Hudson River. He learned the art of performing from his friend and mentor Pete Seeger. McLean accompanied Seeger on his Clearwater boat trip up the Hudson River in 1969 to raise awareness about environmental pollution in the river. During this time McLean wrote songs that would appear on his first album, Tapestry. McLean co-edited the book Songs and Sketches of the First Clearwater Crew with sketches by Thomas B. Allen for which Pete Seeger wrote the foreword. Seeger and McLean sang "Shenandoah" on the 1974 Clearwater album. McLean recorded Tapestry in 1969 in Berkeley, California, during the student riots. After being rejected 72 times by labels, the album was released by Mediarts, a label that had not existed when Don first started to look for a label. It attracted good reviews but little notice outside the folk community, though on the Easy Listening chart "Castles in the Air" was a success, and in 1973 "And I Love You So" became a number 1 Adult Contemporary hit for Perry Como. McLean's major break came when Mediarts was taken over by United Artists Records, thus securing the promotion of a major label for his second album, American Pie. The album spawned two No. 1 hits in the title song and "Vincent". American Pie's success made McLean an international star and piqued interest in his first album, which charted more than two years after its initial release. McLean's magnum opus, "American Pie", is a sprawling, impressionistic ballad inspired partly by the deaths of Buddy Holly, Ritchie Valens and J.P. Richardson (The Big Bopper) in a plane crash on February 3, 1959. The song popularized the expression "The Day the Music Died" in reference to this event. The song was recorded on May 26, 1971, and a month later received its first radio airplay on New York's WNEW-FM and WPLJ-FM to mark the closing of Fillmore East, the famous New York concert hall. "American Pie" reached number one on the Billboard Hot 100 from January 15-February 5, 1972, and remains McLean's most successful single release. The single also topped the Billboard Easy Listening survey. With a total running time of 8:36 encompassing both sides of the single, it is also the longest song to reach No. 1. Some stations played only part one of the original split-sided single release. WCFL DJ Bob Dearborn unraveled the lyrics and first published his interpretation on January 7, 1972, eight days before the song reached No. 1 nationally (see "Further reading" under American Pie). Numerous other interpretations, which together largely converged on Dearborn's interpretation, quickly followed. McLean declined to say anything definitive about the lyrics until 1978. Since then McLean has stated that the lyrics are also somewhat autobiographical and present an abstract story of his life from the mid-1950s until the time he wrote the song in the late 1960s. In 2001 "American Pie" was voted No. 5 in a poll of the 365 Songs of the Century compiled by the Recording Industry Association of America and the National Endowment for the Arts. The top five: "Over the Rainbow", written by Harold Arlen and E.Y. "Yip" Harburg (performed by Judy Garland in the 1939 film The Wizard of Oz); "White Christmas", written by Irving Berlin (best-known performance by Bing Crosby); "This Land Is Your Land", written and performed by Woody Guthrie; "Respect", written by Otis Redding (best-known performance by Aretha Franklin); and "American Pie". On April 7, 2015, McLean’s original working manuscript for "American Pie" sold for $1,205,000 (£809,524/€1,109,182) at Christie’s auction rooms, New York, making it the third highest auction price achieved for an American literary manuscript. 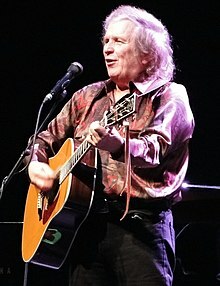 Personnel from the American Pie album sessions were retained for his third album Don McLean, including producer, Ed Freeman, Rob Rothstein on bass and Warren Bernhardt on piano. The song "The Pride Parade" provides an insight into McLean's immediate reaction to stardom. McLean told Melody Maker magazine in 1973 that Tapestry was an album by someone previously concerned with external situations. American Pie combines externals with internals and the resultant success of that album makes the third one (Don McLean) entirely introspective." Other songs written by McLean for the album included "Dreidel" (number 21 on the Billboard chart) and "If We Try" (number 58), which was subsequently recorded by Olivia Newton-John. "On the Amazon" from the 1920s musical Mr Cinders was an unusual choice but became an audience favorite in concerts and featured in Till Tomorrow, a documentary film about McLean produced by Bob Elfstrom (Elfstrom held the role of Jesus Christ in Johnny and June Cash's Gospel Road). The film shows McLean in concert at Columbia University as he was interrupted by a bomb scare. He left the stage while the audience stood up and checked under their seats for anything that resembled a bomb. After the all-clear, McLean re-appeared and sang "On the Amazon" from exactly where he had left off. Don Heckman reported the bomb scare in his review for The New York Times entitled "Don McLean Survives Two Obstacles." The fourth album, Playin' Favorites was a top-40 hit in the UK in 1973 and included the Irish folk classic, "Mountains of Mourne" and Buddy Holly's "Everyday", a live rendition of which returned McLean to the UK Singles Chart. McLean said, "The last album (Don McLean) was a study in depression whereas the new one (Playin' Favorites) is almost the quintessence of optimism, with a feeling of 'Wow, I just woke up from a bad dream.'" The 1974 album Homeless Brother, produced by Joel Dorn, was McLean's final studio collaboration with United Artists. The album featured fine New York session musicians, including Ralph McDonald on percussion, Hugh McCracken on guitar and a guest appearance by Yusef Lateef on flute. The Persuasions sang the background vocals on "Crying in the Chapel" and Cissy Houston provided a backing vocal on "La La Love You". The album's title song was inspired by Jack Kerouac's book, Lonesome Traveler in which Kerouac tells the story of America's "homeless brothers", or hobos. The song features background vocals by Pete Seeger. Of the more than 200 studio albums I've produced in the past forty plus years, there is a handful; maybe fifteen or so that I can actually listen to from top to bottom. Homeless Brother is one of them. It accomplished everything I set out to do. And it did so because it was a true collaboration. Don brought so much to the project that all I really had to do was capture what he did, and complement it properly when necessary. 1977 saw a brief liaison with Arista Records that yielded the Prime Time album and, in October 1978, the single "It Doesn't Matter Anymore". This was a track from the Chain Lightning album that should have been the second of four with Arista. McLean had started recording in Nashville, with Elvis Presley's backing singers, The Jordanaires, and many of Elvis's musicians. However the Arista deal broke down following artistic disagreements between McLean and the Arista chief, Clive Davis. Consequently, McLean was left without a record contract in the USA, but through continuing deals the Chain Lightning album was released by EMI in Europe and by Festival Records in Australia. In April 1980, the track "Crying" from the album began picking up airplay on Dutch radio stations and McLean was called to Europe to appear on several important musical variety shows to plug the song and support its release as a single by EMI. The song achieved number 1 status in the Netherlands first, followed by the UK and then Australia. McLean's number 1 successes in Europe and Australia led to a new deal in the USA with Millennium Records. They issued the Chain Lightning album two and a half years after it had been recorded in Nashville, and two years after its release in Europe. It charted on February 14, 1981 and reached number 28 while "Crying" climbed to number 5 on the pop singles chart. Roy Orbison himself thought that McLean’s version was the best cover he’d ever heard of one of his songs. Orbison thought McLean did a better job than he did and even went so far as to say that the voice of Don McLean is one of the great instruments of 20th Century America. According to Brian Wilson of the Beach Boys, "McLean's voice could cut through steel - he is a very pure singer and he's up there with the best of them. He's a very talented singer and songwriter and he deserves his success." The early 1980s saw further chart successes in the U.S. with "Since I Don't Have You", a new recording of "Castles in the Air" and "It's Just the Sun". In 1987, the release of the country-based Love Tracks album gave rise to the hit singles "Love in My Heart" (a top-10 in Australia), "You Can't Blame the Train" (U.S. country No. 49), and "Eventually". The latter two songs were written by Houston native Terri Sharp. In 1991, EMI reissued the "American Pie" single in the United Kingdom and McLean performed on Top of the Pops. In 1992, previously unreleased songs became available on Favorites and Rarities while Don McLean Classics featured new studio recordings of "Vincent" and "American Pie". McLean has continued to record new material including River of Love in 1995 on Curb Records and, more recently, the albums You've Got to Share, Don McLean Sings Marty Robbins and The Western Album on his own Don McLean Music label. Addicted to Black was released in May 2009. "And I Love You So" was covered by Elvis Presley, Helen Reddy, Shirley Bassey, Glen Campbell, Engelbert Humperdinck, Howard Keel, Claude François, and a 1973 hit for Perry Como. "Vincent", a tribute to the 19th-century Dutch painter, Vincent van Gogh. Although it only reached No. 12 on the Billboard Hot 100, it proved to be a huge hit worldwide. "You can't change a note in that song" (Mike Mills, REM). It was a No. 1 hit single in the UK Singles Chart. This song was covered by NOFX on their album titled 45 or 46 Songs That Weren't Good Enough to Go on Our Other Records, and also appears on the Fat Wreck Chords compilation Survival of the Fattest. "Vincent" was also covered by Josh Groban on his 2001 debut album. "Castles in the Air", which McLean recorded twice. His 1981 re-recording was a top-40 hit, reaching #36 on the Billboard Hot 100 in late 1981. "Wonderful Baby", a tribute to Fred Astaire that Astaire himself recorded. Primarily rejected by pop stations, it reached #1 on the Billboard Easy Listening survey. "Superman's Ghost", a tribute to George Reeves, who portrayed Superman on television in the 1950s. "The Grave", a song that McLean had written about the Vietnam War, was covered by George Michael in 2003 in protest against the Iraq War. The American Pie album features a version of Psalm 137, entitled "Babylon". The song is based on a canon by Philip Hayes and was arranged by McLean and Lee Hays (of The Weavers). "Babylon" was performed in the Mad Men episode of the same name despite the fact that the song would not be released until 10 years after the time in which the episode is set. In 1981, McLean had an international number one hit with a cover of the Roy Orbison classic, "Crying". It was only after the record became a success overseas that it was released in the U.S. The single hit No. 5 on the Billboard Hot 100 in 1981. Orbison himself once described McLean as "the voice of the century", and a subsequent re-recording of the song saw Orbison incorporate elements of McLean's version. For the 1982 animated cult-movie The Flight of Dragons, produced by Jules Bass and Arthur Rankin, Jr., McLean sang the opening theme. However, no soundtrack has ever been released. Another hit song associated with McLean (though never recorded by him) is "Killing Me Softly with His Song", which was claimed by Lori Lieberman to have been written about McLean after she, also a singer/songwriter, saw him singing his composition "Empty Chairs" in concert. Afterwards (according to Lieberman) she wrote a poem about the experience and shared it with Norman Gimbel, who had long been searching for a way to use a phrase he had copied from a novel badly translated from Spanish to English, "killing me softly with his blues". Allegedly, Gimbel and Charles Fox reworked the poem and the phrase into the song "Killing Me Softly with His Song", originally recorded by Lieberman and covered by Roberta Flack (and later covered by The Fugees). This claim was disputed, notably by Fox. Subsequently, however, the matter reached an unequivocal conclusion when contemporaneous articles from the early 1970s were exhumed, all of them vindicating Lieberman. In an April 5, 1973 article in the New York Daily News, Norman Gimbel was quoted as follows: "She [Lori Lieberman] told us about this strong experience she had listening to McLean ("I felt all flushed with fever / Embarrassed by the crowd / I felt he had found my letters / And read each one out loud / I prayed that he would finish / But he just kept right on…"). I had a notion this might make a good song so the three of us discussed it. We talked it over several times, just as we did for the rest of the numbers we wrote for this album and we all felt it had possibilities." McLean's albums did not match the commercial success of American Pie but he became a major concert attraction in the U.S. and overseas. His repertoire included old concert hall numbers and the catalogues of singers such as Buddy Holly, and another McLean influence, Frank Sinatra. The years spent playing gigs in small clubs and coffee houses in the 1960s transformed into well-paced performances. McLean's first concerts at Carnegie Hall in New York and the Albert Hall in London in 1972 were critically acclaimed. In recent years McLean has continued to tour North America, Europe (2011, 2012) and Australia (2013). In June 2011 McLean appeared at the Glastonbury Festival in Pilton, UK, and in 2014 at California's Stagecoach Country Music Festival. In May 2015, McLean undertook his 20th nationwide tour of the UK and Ireland. In 1991, Don McLean returned to the UK top 20 with a re-issue of "American Pie". Iona College conferred an honorary doctorate on McLean in 2001. In February 2002, "American Pie" was inducted into the Grammy Hall of Fame. In 2004, McLean was inducted into the Songwriters Hall of Fame. Garth Brooks presented the award and said, "Don McLean: his work, like the man himself, is very deep and very compassionate. His pop anthem 'American Pie' is a cultural phenomenon". Two years later, Brooks repaid the favor by appearing as a special guest (with Nanci Griffith) on McLean's first American TV special, broadcast as the PBS special Starry Starry Night. A month later, McLean wound up the 20th century by performing "American Pie" at the Lincoln Memorial Gala in Washington D.C. In 2007, the biography The Don McLean Story: Killing Us Softly With His Songs was published. Biographer Alan Howard conducted extensive interviews for this, the only book-length biography of the often reclusive McLean to date. In February 2012 McLean won the BBC Radio 2 Folk Awards Life Time Achievement award. In March 2012, the PBS network broadcast a feature-length documentary about the life and music of Don McLean called "Don McLean: American Troubadour" produced by 4-time Emmy Award-winning filmmaker Jim Brown. McLean is one of UK singer-songwriter Jake Bugg's primary influences. Bugg said McLean's song "Vincent" was "the first song I liked" after hearing it on an episode of The Simpsons. He devoured McLean's back catalogue and then delved into the artists that inspired McLean - including Buddy Holly and The Weavers. Tupac Shakur also cited McLean's "Vincent" as a personal inspiration. McLean is credited as writer of Drake's song "Doing It Wrong" featuring Stevie Wonder. The song includes lyrics from two McLean compositions - "The Wrong Thing to Do" and "When a Good Thing Goes Bad" both of which featured on his 1977 album "Prime Time". In March 2017, Don McLean's "American Pie" single was designated an "aural treasure" by the Library of Congress, "worthy of preservation" in the National Recording Registry "as part of America’s patrimony". He was raised in the Roman Catholic faith of his mother; his father was a Protestant. He was married to Patrisha McLean (née Shnier) from 1987 until their divorce in June 2016. They lived in Camden, Maine, with their two children, Jackie and Wyatt. On January 18, 2016, McLean was arrested in Camden for a misdemeanor domestic violence charge. On July 21, 2016, McLean plead guilty to charges of misdemeanour domestic violence assault, domestic violence criminal threatening, criminal mischief and criminal restraint against Patrisha McLean. ATapestry wasn't charted in the UK until 1972 after the success of American Pie. BChain Lightning also peaked at No. 3 on the RPM Country Albums chart in Canada. ^ a b c d e f g Howard, Alan (2007). The Don McLean Story: Killing Us Softly With His Songs. Lulu Press Inc. p. 420. ISBN 978-1-4303-0682-5. ^ a b Arnold, Thomas (March 23, 1990). "Bye-Bye, Mr. 'American Pie' -- Don McLean Gives His Pen a Rest". Los Angeles Times. ^ "Don McLean (Music)". TV Tropes. Retrieved August 25, 2015. ^ However, Casey Kasem confirmed the main outline of what Dearborn had said, and seemed to indicate that McLean agreed with that outline, on the January 15, 1972 edition of American Top 40, when "American Pie" had just ascended to #1 on the Hot 100. ^ "Don McLean's American Pie". Don McLean Online - The Official Website. ^ "Don McLean's "American Pie": The Original Lyrics". Christies.com. Retrieved August 25, 2015. ^ The Great Olivia Newton-John, Festival Records, 1999. ^ a b c Don McLean: An American Troubadour (Television production). UK: Sky Arts 1. 2013. ^ "Don McLean Online". Archived from the original on November 23, 2012. ^ "Official Website For Josh Groban". Joshgroban.com. February 24, 2007. Retrieved August 25, 2015. ^ a b Whitburn, Joel (2004). The Billboard Book of Top 40 Hits, 8th Edition (Billboard Publications), p. 416. ^ Hyatt, Wesley (1999). The Billboard Book of #1 Adult Contemporary Hits (Billboard Publications), p. 166. ^ "Don McLean Live Tour Festivals 2015". Festivalsearcher.com. Retrieved August 25, 2015. ^ a b O'Haire, Patricia (April 5, 1973). "A Killer of a Song". Daily News. New York. p. 6. ^ Davis, Sheila (1984). The Craft of Lyric Writing. Writers Digest Books. p. 13. ISBN 0-89879-149-9. Retrieved September 22, 2010. ^ Billboard Magazine, June 22, 1974, p. 53. ^ "Don McLean Online — The Official Website of Don McLean and American Pie". Don-mclean.com. Retrieved August 25, 2015. ^ "BBC Glastonbury Festival". BBC. June 26, 2011. Retrieved August 25, 2015. ^ "Stagecoach 2014: Don McLean performs emotional set for fans, celebs Ashton Kutcher and Mila Kunis". Dailynews.com. April 27, 2014. Retrieved August 25, 2015. ^ "Iona College". Colleges.usnews.rankingsandreviews.com. Retrieved January 12, 2013. ^ "GRAMMY Hall Of Fame". The GRAMMYs. Retrieved 2017-01-31. ^ "Gloomy Don McLean reveals meaning of 'American Pie' — and sells lyrics for $1.2 million". Washington Post. Retrieved 2017-02-04. ^ "Songwriters Hall of Fame - Don McLean Exhibit Home". www.songwritershalloffame.org. Retrieved 2017-01-31. ^ "Radio 2 - Events - Radio 2 Folk Awards 2012". BBC. February 8, 2012. Retrieved April 15, 2012. ^ "Don McLean: American Troubadour". KPBS.org. 6 November 2012. Retrieved 27 January 2017. ^ "Jake Bugg: I have to Pinch Myself". BBC News. Retrieved July 14, 2014. ^ "Tupac Shakur: Biography". Internet Movie Database. Retrieved July 14, 2014. ^ "Doing it Wrong". AllMusic. Retrieved July 15, 2014. ^ "Don McLean: Legendary Singer-Songwriter". Paul Leslie. Retrieved January 16, 2016. ^ "'American Pie' singer Don McLean and wife finalize divorce". NY Daily News. Retrieved 2017-04-05. ^ "A Photographer's Point of View". Maine Home + Design. August 1, 2009. Retrieved February 12, 2013. ^ Staff. "Camden police arrest singer-songwriter Don McLean for assault". WCSH6.com. Retrieved December 2, 2016.